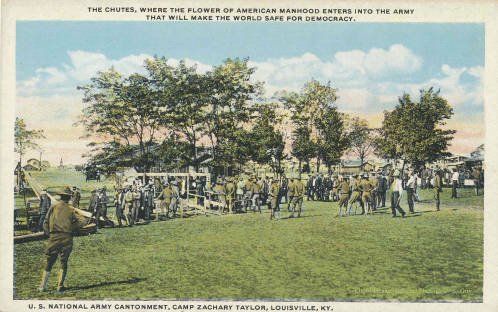 "Where the Flower of American Manhood Enters into the Army that Will Make the World Safe for Democracy"
The United States military established Camp Zachary Taylor in Louisville amidst the charged wartime atmosphere of World War I. Historical Marker #2126 commemorates Camp Zachary Taylor, one of sixteen national army training camps created during World War I. The city of Louisville won the contest to host the camp over competition from other regional centers, including Lexington, Danville, Bowling Green, Terra Haute and Evansville. The city boasted several advantages over its rivals, including a central location in the mid-west region, a larger population and more amenities, and good railroad connections to both north and south. 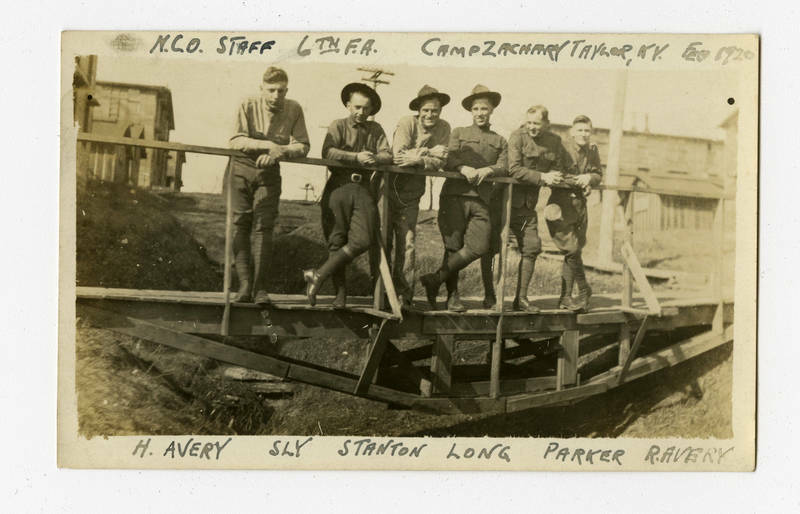 Established south of the city in June 1917, Camp Zachary Taylor quickly became a hub of Kentucky’s wartime activity. Camp Taylor emerged from the agricultural fields in a remarkably short time. Constructing the camp took only ninety days, but cost over $9 million. The result was essentially a new city on the outskirts of Louisville, home to roughly 2,000 buildings and between 40,000 and 63,000 troops depending on which units were training there at any given time. Thousands of railcars arrived annually, constantly adding new men and material to the bustling camp. 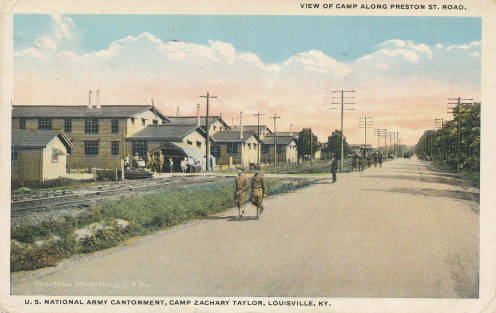 The economic activity created by the construction and operation of Camp Taylor proved a boon to the local economy by pumping money into the system, creating a demand for labor and spurring an expansion of city infrastructure. 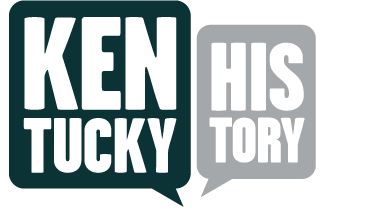 When Kentuckians decided to volunteer or were drafted into the military, their thoughts might have gone to the battlefields of Europe, but their bodies often first travelled to Camp Zachary Taylor for training. The camp saw a variety of people cycle through as approximately 150,000 troops trained there during its brief existence. The training ranged from infantry to artillery and even produced military chaplains. 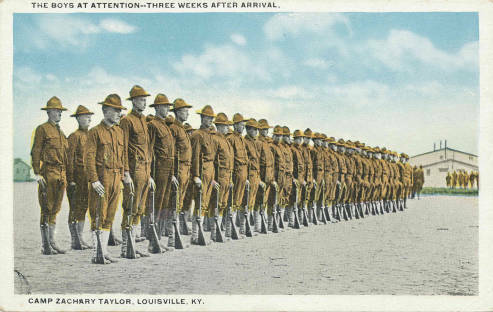 White soldiers from Kentucky, Indiana and Illinois who comprised the Eighty-Fourth Division, also known as the “Lincoln Division,” were among the first to train at Camp Zachary Taylor. The division included two infantry brigades, an artillery brigade, machine and signal gun battalions and supporting units that included everything from engineers to cooks to handlers for the 7,000 horses at the camp. The division stopped over at the camp in Chillicothe, Ohio for advanced training before they left for France in September 1918. In Europe, the men of the Eighty-Fourth service mainly as replacements for units that had dropped below their initial numbers. World War I was a charged time in race relations in the country, and Kentucky’s Camp Zachary Taylor was not immune. The conflict, framed as a battle to make the world safe for democracy, threw the second-class status imposed on many African Americans into sharp relief. This was all the more galling to proponents of equality as African Americans stepped up to play their part in the war effort, both in and out of uniform. The military remained segregated throughout the war and most black troops served under white officers. Yet training centers, including Camp Zachary Taylor, saw both white and black units cycle through. 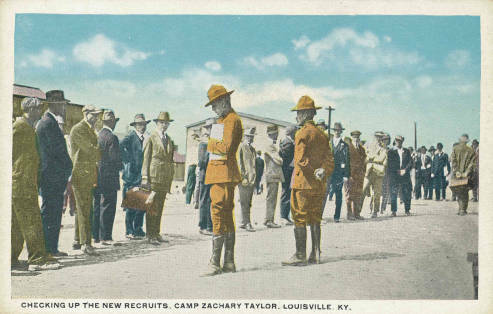 More than 3,000 black Kentuckians were drafted and the majority passed through Camp Taylor for training. The military relegated most black troops to supporting and laboring roles, but the performance of those who saw combat typically equaled that of their white counterparts. 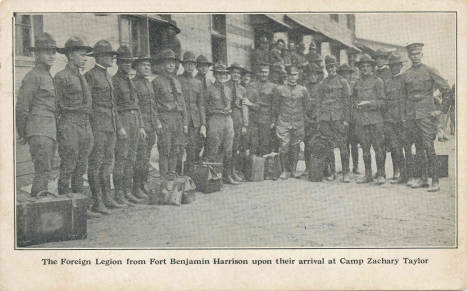 The segregation of Camp Taylor extended to the organizations that were responsible for supporting the troops and providing some of the comforts of home life. For instance, black troops could enjoy a segregated Soldiers Club in downtown Louisville and a black housing bureau administered by the Young Women’s Christian Association helped provide housing for family and friends visiting the black soldiers. Yet, the access to recreational amenities that African American troops enjoyed lagged behind those provided to white soldiers. Along with the massive undertaking of physically preparing the country for war, many organizations turned their attention to providing emotional and psychological support to the men in uniform. 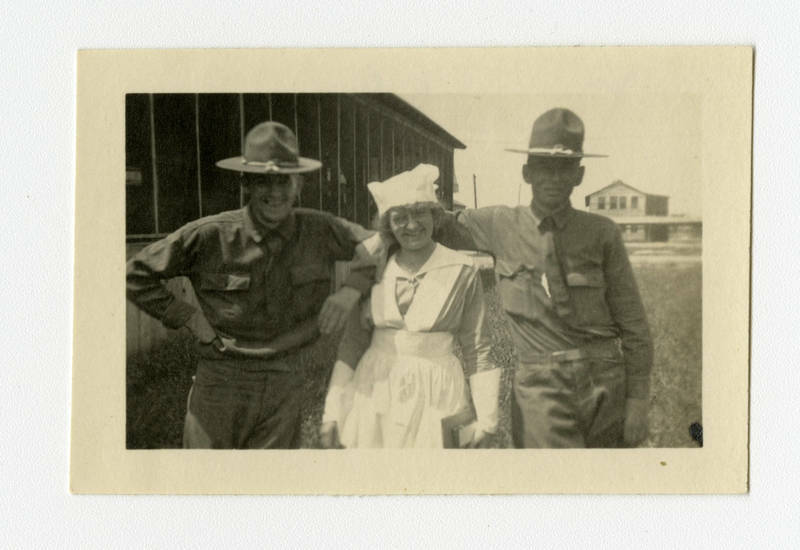 Organizations with a major presence at Camp Taylor included the American Library Association, the War Camp Community Service group, the Salvation Army, the Knights of Columbus, the Jewish Welfare Board, the Young Women’s Christian Association and the Young Men’s Christian Association. These groups catered to the spiritual, educational and extracurricular needs of the troops, providing everything from religious services and basic literacy to organized baseball games. During the summer of 1918, a new and immediate danger threatened Camp Taylor: Spanish influenza. The densely packed troops at the camp provided a fertile environment for the epidemic to take hold. The flu spread rapidly; the first cases emerged in September and soon more than 10,000 soldiers were hospitalized. Fifteen barracks were converted into hospital wards and doctors, nurses and other civilian volunteers stepped in to try to help stem the tide of illness. Ultimately, more than 1,500 died at Camp Taylor from the epidemic. As was the case across the state, the flu virus took a much higher toll on Camp Taylor than that exacted on the battlefields of Europe. The microscopic organism killed far more Kentuckians than German troops did and added a sober note to celebrations of Allied victory in the war. Just as U.S. entry into the war touched off a flurry of construction, the end of the conflict saw rapid demobilization. Camp Taylor was a major demobilization point, with hundreds of thousands of troops briefly passing through as they were processed out of the military. 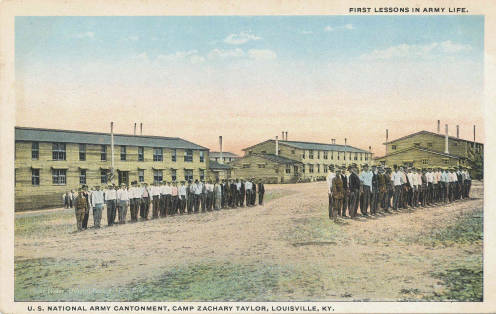 Officials closed Camp Zachary Taylor in 1920, only three years after it opened. More than 2,500 acres were auctioned off in 1,500 parcels the following year. This sale established the foundation of a new Louisville suburb named, appropriately enough, Camp Taylor. Today, this neighborhood lies west of Poplar Level Road just inside the Henry Watterson Expressway. Historical Marker #2126 was dedicated in 2003 through the support of Stock Yards Bank and Trust. Andrew Patrick, “Camp Zachary Taylor,” ExploreKYHistory, accessed April 22, 2019, https://explorekyhistory.ky.gov/items/show/777.